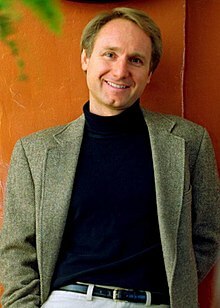 Dan Brown (born June 22, 1964) is an American author. His best-known book is The Da Vinci Code. Dan Brown lives in the United States. His father was a math teacher and his mother was a church organist. Before Dan Brown wrote books, he was an English teacher. Dan Brown's wife, Blythe, is an artist. Sometimes she is known to help him with his books. Dan Brown also likes to write about codes and secrets. Sometimes he writes about real secrets, but he mostly writes fiction. Hollywood director Ron Howard made a movie about one of Brown's books. Tom Hanks is the movie's star actor. It was released in theaters in May 2006. Brown's next book was supposed to be called The Solomon Key, but then the name was changed to The Lost Symbol. When the book The Da Vinci Code came out in the United States, there were some puzzles hidden in the art of the book cover. Brown said that the answers to those puzzles give hints about what would be in his next book. Two of the puzzles are about a famous sculpture called Kryptos, which is in the middle of the CIA Headquarters building in Washington D.C.
↑ 1.0 1.1 "Dan Brown". Famous Authors. Retrieved 20 February 2016. ↑ Boris Kachka (6 September 2009). "How Dan Brown Became Dan Brown". New York Books. Retrieved 20 February 2016. This page was last changed on 20 February 2016, at 20:45.